Circa 1873 wonderful George Jones hand painted leaf plate. 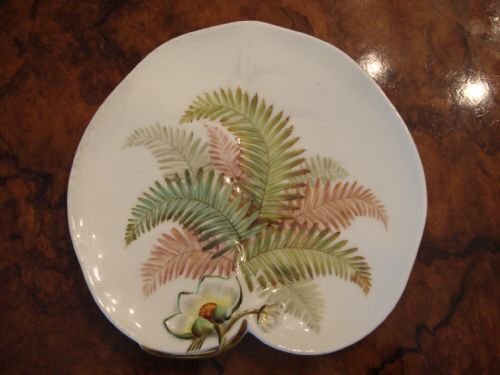 A wonderful Circa 1873 hand painted leaf plate by George Jones famous maker. 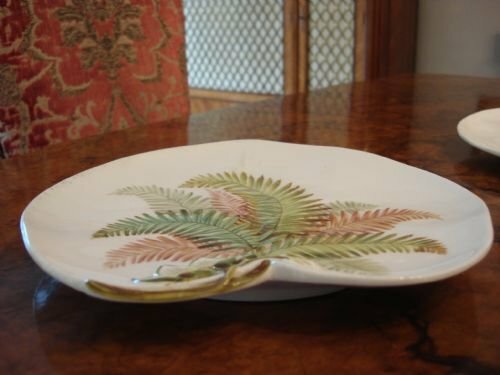 The white ground leaf plate has been moulded with appropriate leaf veins and shape and with a water lily that stands proud at the base with beautiful ferns to centre. 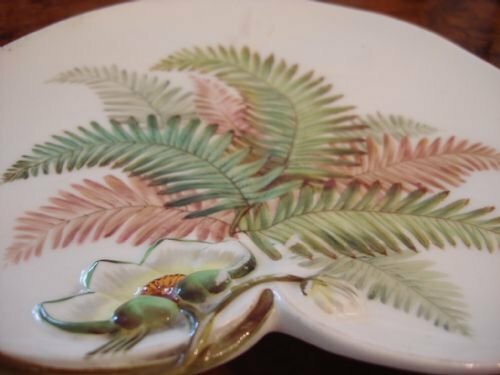 Ferns were an extremely popular design for porcelain and glass in the Victorian period. All have been hand painted in lovely colours. Another is available with a different design to centre if a pair is desired, as seen in photo. Size-8.75 inches long by 8.5 inches wide by 1 inch deep. A very stylish George Jones plate in very good condition. Circa 1880 Mintons plate with lovely style. 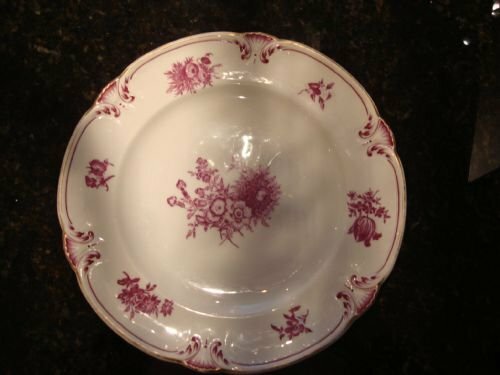 Lovely Circa 1880 Mintons plate with amethyst foliate pattern on a white ground, and with shaped and gilded edge, from my own collection. 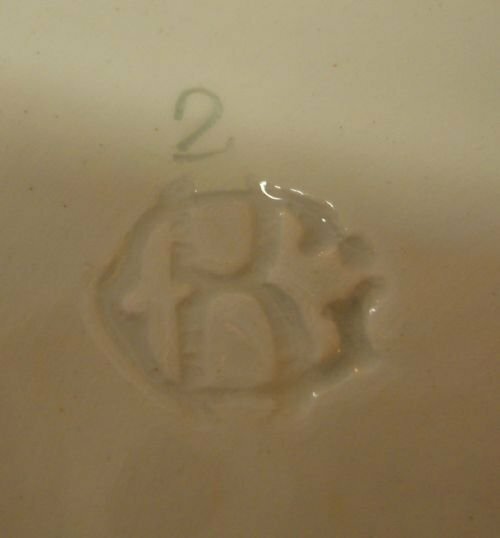 This pretty plate has impressed Mintons marks as well as a painted pattern number H2011. 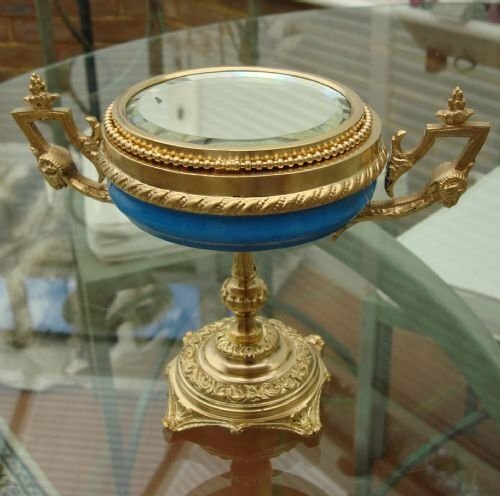 With one small hairline seen on the back, and some wear to the gilt edge, it is in very good condition overall, and makes a lovely addition to a collection, or a great cabinet plate. 19th century Continental (probably Belgian or French) fabulous tin glazed pottery service in intricate basket design, comprising a total of 17 pieces: 9 plates plus 8 different and unusually shaped footed serving dishes. All pieces have pierced basket edges entwined with ribbons to edge. The ribbon edge colours are either blue, pink or lavender. Every piece has been individually hand painted with landscapes, with every one having a different scene. Size-plates: 8 3/8 inches diameter; serving dishes: the 2 round are 8 inches diameter by 2.75 inches high; the 4 lozenge shaped are 12 inches long by 7 inches wide by 2 inches high; the 2 tri-lobed shaped are 6 inches wide by 2 inches high. In remarkable condition, with two of the serving pieces having professional and collectable 19th century rivet repairs. Makers mark was not traced, and is shown in last photo. It appears to be a stylised CB and sometimes also appears with a C.B in block letters in addition, as well as impressed numbers for styles. A rare service to use or display, in very good condition. 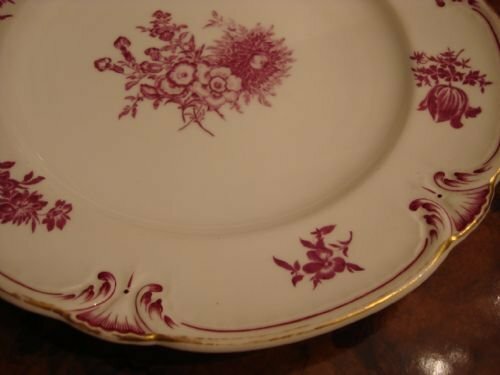 Royal Worcester porcelain hand painted fruit plate, signed by the artist, H. Everett, and marked with the 1924 date mark, during the heyday of the famous Royal Worcester fruit artists. These artists used the porcelain as canvases to express their artistic talent and create life like designs that they were allowed by Royal Worcester to personally sign. 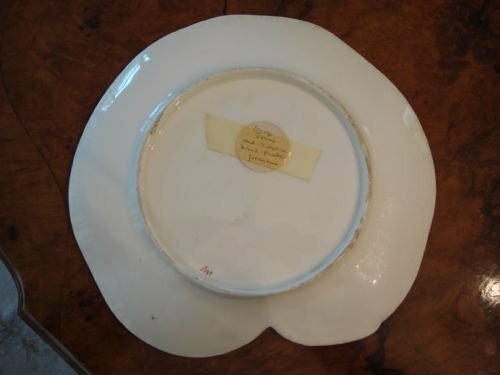 Plates from the 1920's are among the most sought after. 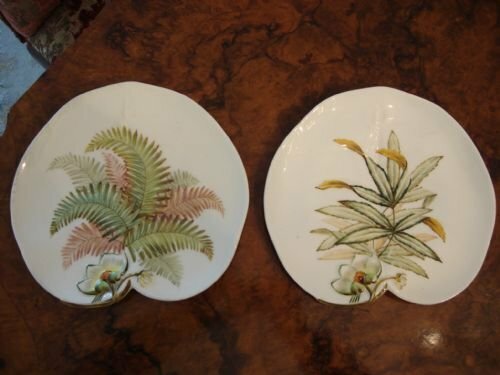 This side plate has absolutely gorgeous colours, with the fruit so beautifully and realistically painted on the exquisitely mottled background, finishing with gilt edging. 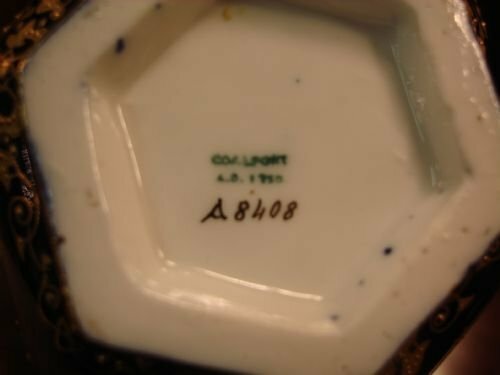 The puce coloured Royal Worcester date mark for 1924 is on reverse. Size is 6.5 inches in diameter, or 16 cm. There is some light crazing to the glaze, difficult to see except under high magnification. It is in otherwise excellent condition. 1956, marked and impressed with date letter, a very unusual pair of Gien faience biscuit porcelain Chinoiserie style square baluster vases with bird and floral decoration. 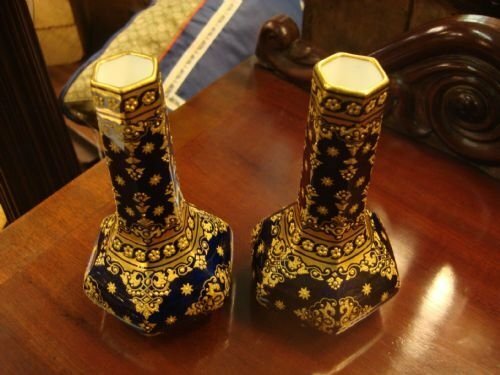 Gien is a fine French maker known for their craftsmanship, artistry, and unusual shapes. The pair is beautifully hand painted with scenes of birds, flowers and insects. This is a very unusual and aesthetic pair, in very good condition, with some minor chips to base rims only. Size 14 inches high by 5 inches wide at widest point, and 4.25 inches deep. Victorian bone china large 18 piece dessert service for 12 people comprising 12 plates, and 6 (3 pairs) shaped serving dishes. 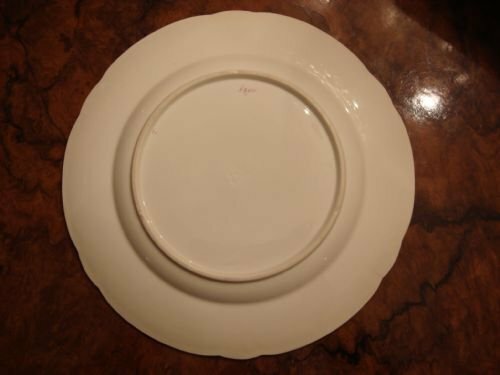 The serving dishes are round, square and lozenge shaped. 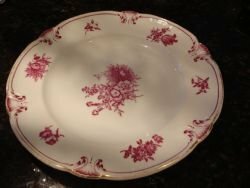 Sizes-plates: 9.25 inches diameter with handles; serving dishes: 8.5 inches by 11.5 inches; 9 5/8 inches by 8.75 inches; 10 5/8 inches by 9.5 inches. In wonderful condition, the service is enriched with gilt leafy and green foliate decoration, and a pierced handle design to the edge. What a lovely impressive set to grace the table, to be used for the dessert or cheese course. The pattern and colours will complement any decor or table setting. A really lovely set in very good condition. Rare to find a complete set for 12 with serving dishes, in such nice condition. This would be a beautiful addition to the table. Circa 1893 large nine piece English Aesthetic period wash set by Ford and Sons. Circa 1893 large nine piece Aesthetic period jug and bowl extended washing set by Ford and Sons in the Tudor pattern. The company mark was only used 1893-1907. The very striking combination of transfer and hand painted stylised flower decoration also corresponds to that period of the late 19th and early 20th century. The service comprises a large bowl with tall jug, and unusually another matching jug, a waste bucket with rare original draining top, a toothbrush jug, and a three piece soap dish. Size-jugs 13.75 inches high by 9 inches wide with handle; bowl 16.5 inches diameter by 6 inches high; waste bucket 11.25 inches high by 10 inches diameter; toothbrush jug 6 inches high by 3 5/8 inches deep; soap dish 5.75 inches diameter by 3.5 inches high. 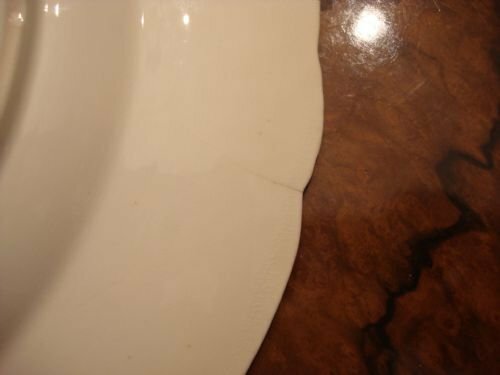 The set is in very good condition generally with some minor chipping or hairlines to a couple of pieces, while the bowl portion of the soap dish has significant flaking. Today, the waste bucket is often used as a waste basket, while the other pieces are decorative, or often hold flowers. A very stylish and decorative set for the wash stand or to display. 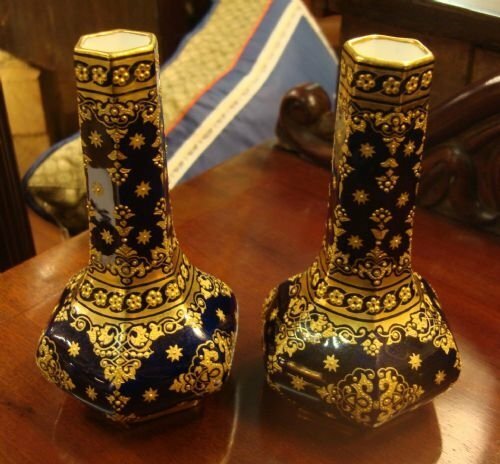 Coalport Victorian lovely pair of porcelain Mazarin blue gilt embellished hexagonal vases. 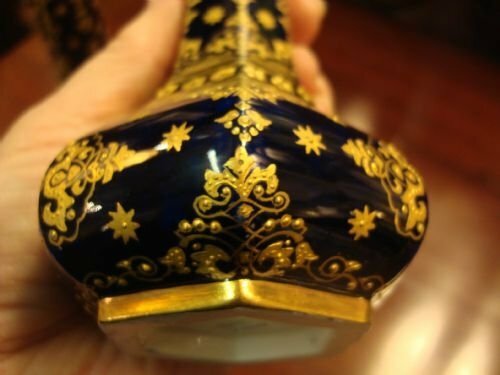 Marked for the period 1875-81, a lovely Victorian pair of Mazarin blue porcelain ground gilt embellished hexagonal vases from the famous maker Coalport. 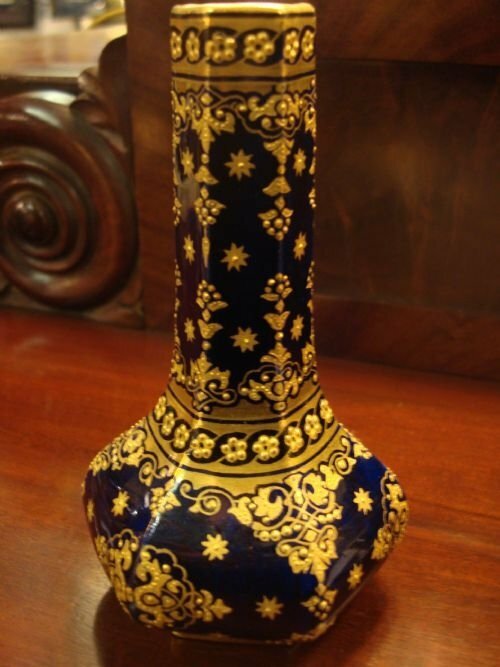 These beautiful vases have a raised gilt overall foliate and scroll pattern, over a speckled beautiful deep blue ground. One vase is very slightly deeper blue than the other. The pattern number is 8408. Size-5.5 inches high by 3 inches wide. A really lovely and decorative pair of vases, with wonderful colour and very good age. In very good condition to use in any room. 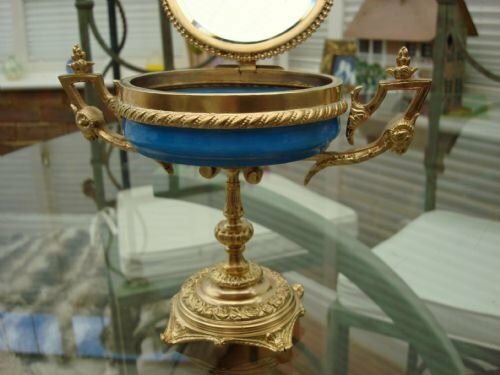 19th century very unusual gilt metal stand with handles, holding porcelain stunning turquoise blue ground hand painted bowl with bevelled mirrored top. Top folds up to stand up straight or tilt providing a mirror to use at different levels depending on the angle placed. 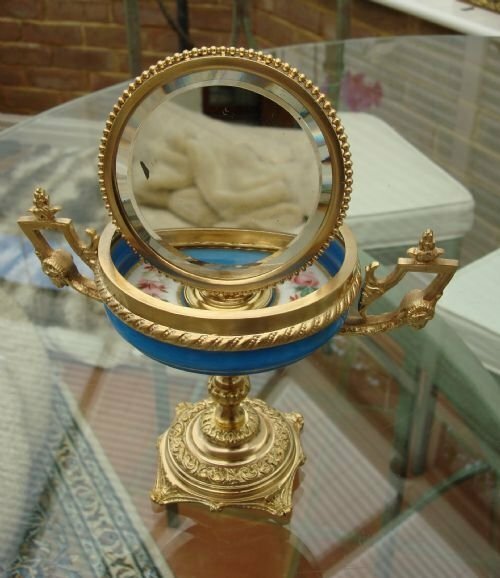 This top mirrored and gilt metal section can also be removed to display just bowl and stand only if desired. 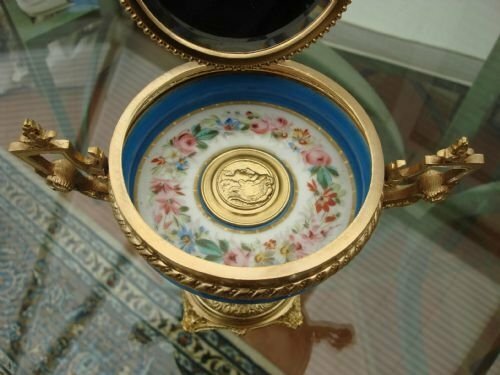 Inside the bowl are lovely hand painted flowers, surrounded by gilt bands, and a centre gilt metal medallion of Minerva's head. Size is 7 inches wide handle to handle by 5.5 inches high closed, or 9.5 inches with mirror fully raised. 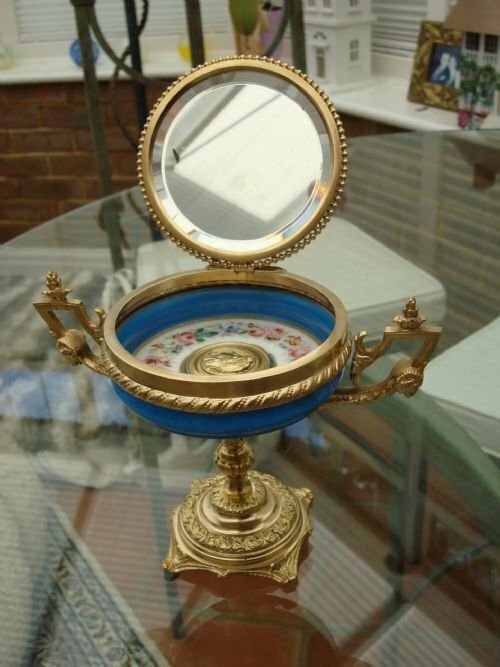 Although this was possibly originally for a ladies dressing table, it would now grace any table on its own, or holding small cherished items. A rare and lovely piece in very good condition.